You are currently browsing the category archive for the ‘leftovers’ category. A long holiday weekend entertaining dinner guests, baby still not sleeping well (still! ), and I was out of steam. More time in the kitchen genuinely did not appeal. 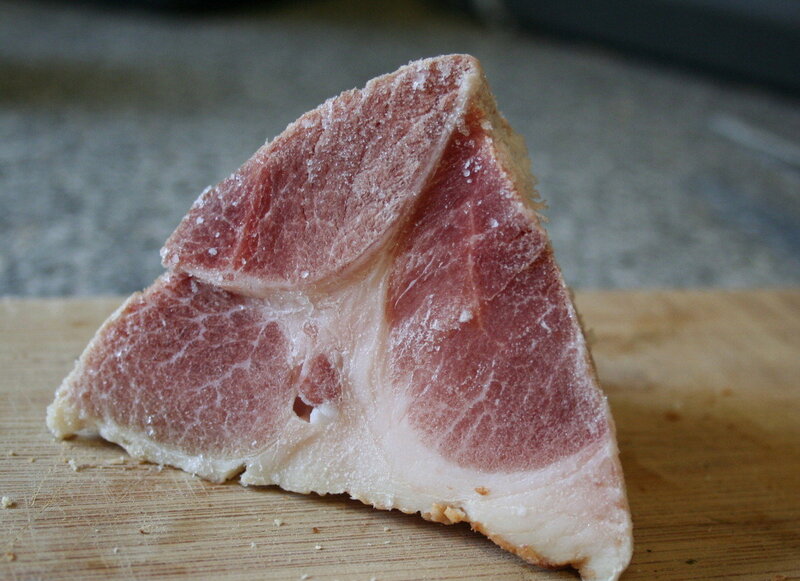 But we had to eat, as these things go, and to help things along was a half-carved leftover ham in the fridge. Hearty soups like split pea or white bean were one idea, but the timing seemed wrong for a warm, sunny evening before a week of forecast rain. Lasagne with ham, mushroom, and ricotta sounded tasty, but too much of a process. Chinese food? I didn’t have the energy to think about it. That’s a lengthy process of elimination to get to this pasta, which cooks quickly and gently and makes use of a few things available locally or in the garden right now. That it’s tasty — the cream picks up a nice hit of smoke from the ham — was our good luck, and it was lovely with leftover wine, a nice Chenin Blanc from Washington state vintner L’Ecole No. 41. Green garlic is around for just a short time in late spring, so there’s not a lot of opportunity for trial and error, at least not in a kitchen like mine, where the emphasis right now is on getting people fed. 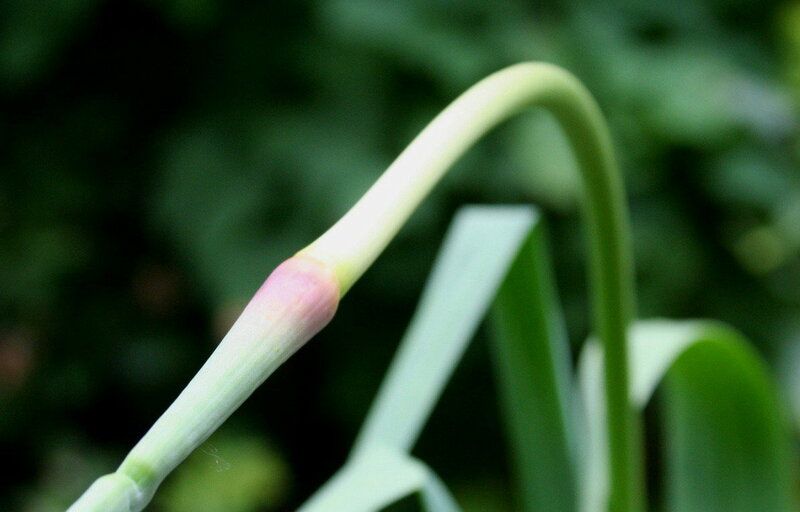 I used small young bulbs and their leaves, which are often compared to leeks in flavor and attitude. The stem was hot and garlicky, and I chopped it into the compost pile instead. Boil salted water, cook pasta, and drain. Meanwhile heat a skillet over medium heat. Mince the young garlic bulbs. Cut garlic leaves in thin slices. Melt butter gently in pan, swirl, then add minced garlic bulbs and ham. 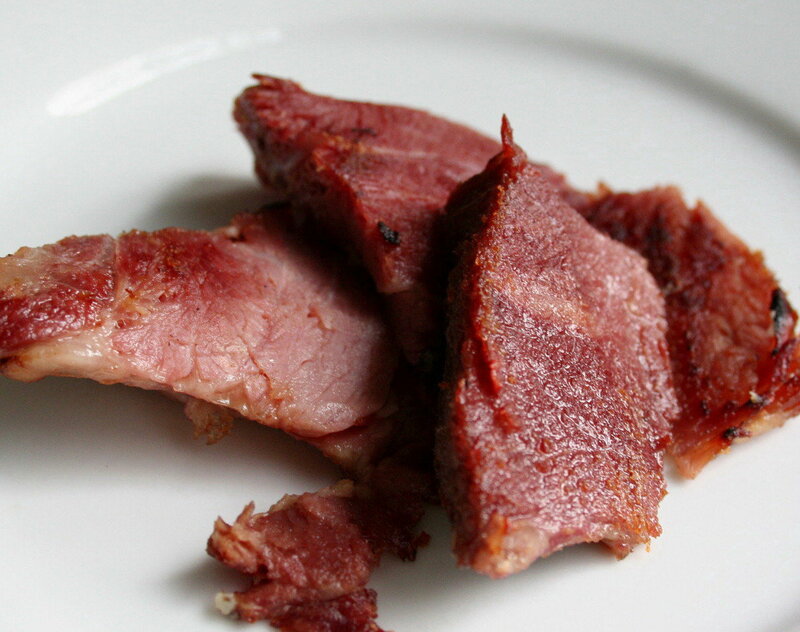 Ham will become warm and fragrant, about 3 minutes. Add peas and cream and cook until slightly reduced, 3-5 minutes more. Season with salt and pepper to taste. 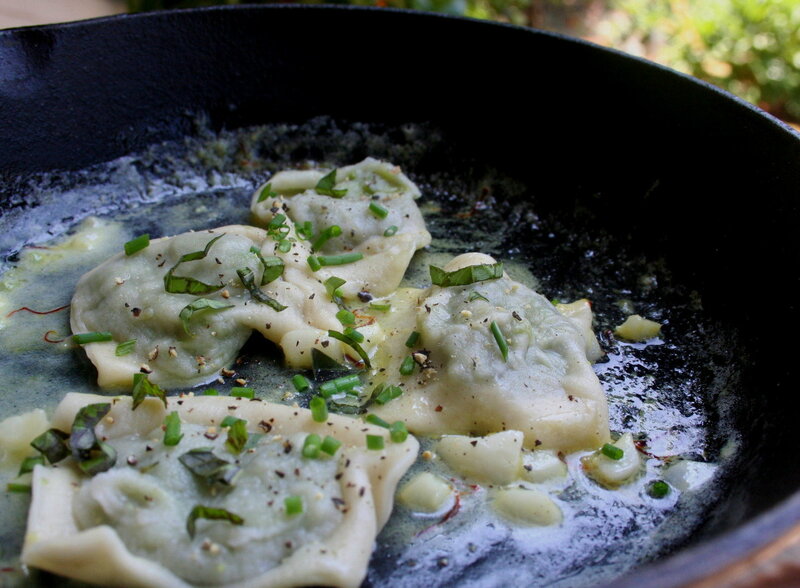 Toss with cooked pasta, Parmesan, and sliced garlic leaves, and serve immediately. Feeds 2. It was a big week for leftovers, and we partook. We transformed roasted sunchokes into sunchoke bisque, enjoyed a cheesy risotto made with squash puree, and ate cold pumpkin pie for breakfast. And we eschewed turkey soup for turkey tetrazzini a la Amanda Hesser. Hers is an easy, delicious way to remake leftover turkey, and we’ve been doing it for years. So we were surprised and a little shocked to learn, upon consulting Hesser’s original recipe, that it only vaguely resembles the baked turkey and mushroom pasta that we eat every year. No matter. We made it up as we went, whisking up a creamy sauce with reconstituted porcinis, cooking the penne al dente, and sticking the whole wet mess of it in the oven. It’s comfort food to the max. There’s nothing like the sound of cheesy sauce bubbling in a hot casserole or the sight of that browned breadcrumb crust. This year’s version was memorable enough to write down and do again next time. Soak porcini in ½ cup hot water. Preheat oven to 400 degrees. Heat butter in a small saucepan. When melted, whisk in flour until mixture is smooth. Stir in stock and marsala and cook over medium heat. Add strained mushroom liquid and chopped porcinis. Add cream or milk to the sauce – it should be pretty thick – and season with salt until it’s fairly salty. Stir in turkey. Meanwhile, parcook penne for about 7 minutes, draining when the pasta still has a slight crunch. Mix sauce and pasta thoroughly – there should be plenty of liquid – and pour everything into an ovenproof casserole dish. Sprinkle with breadcrumbs and cheese, and grind on pepper to taste. Cover with foil and bake approximately 20 minutes, removing foil in the last few minutes so the top browns. Feeds 2. Serve immediately. Adapted from Amanda Hesser. My friend Alice hadn’t used any of the ham roasts from her half-pig and she thought it was time to get her game on. She opted for simple, baking the cured ham to an internal temp of 140, then roasting at higher heat with a mustard and brown sugar glaze. The roast came out juicy and incredibly flavorful, this one being a Wooly Pigs’ Berkshire-Mangalitsa mix, with no need for sauce or other adornment. Extras that came home in a doggy bag got fried up for breakfast and chopped into my beloved old standby, spicy fried rice. Sorry, doggies. Alice herself seemed mainly interested in the hambone, which she saved for split pea soup. Yum. Leftovers. Check out prior posts for more on ham roasting basics and a recipe for roast ham with a mushroom cream sauce. You host a Soup-a-Thon, you get some extra bread. In my case it’s a pingback of sorts, sourdough loaves baked by yours truly, from a starter refurbished after it spent the summer hiberating in back of the fridge. 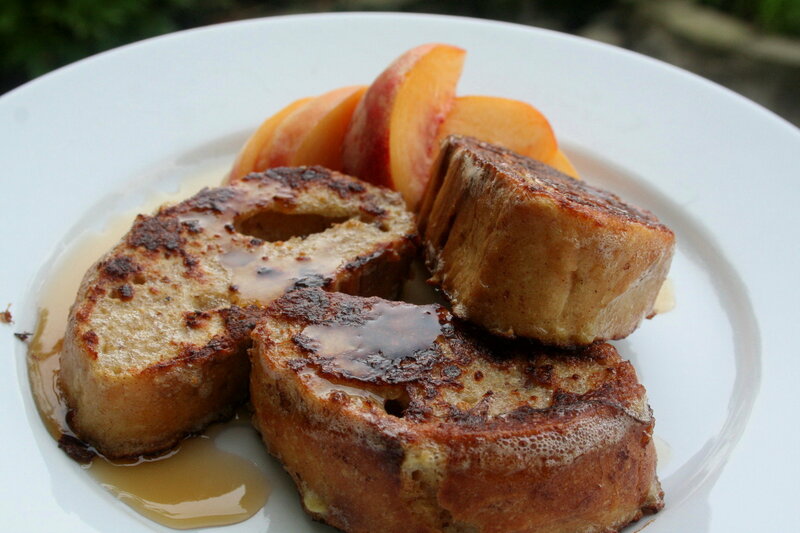 The leftover slices made for lovely, tangy French toast the next morning, and how delicious were those accompanying slices of cold, sweet late-season peach from Alvarez? A quarter of beef arrived last week, one hundred four pounds of pured pastured young cow. To celebrate we grilled a couple of strip steaks with a salt and pepper crust, and, well, holy goodness. It was so deluxe that we swore never to eat out again. The leftovers I claimed for the next day’s lunch. 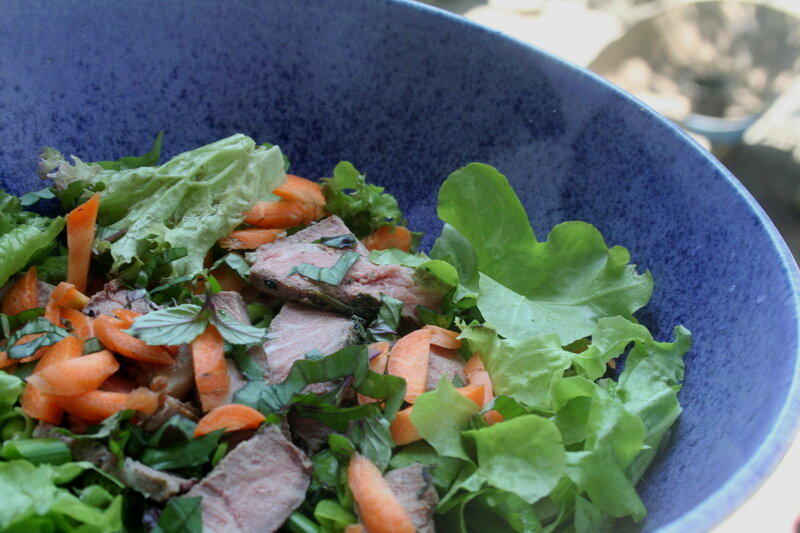 Steak salad, I thought happily, as we wrapped what was left and cleaned the kitchen. The following day, I began to construct my salad from the usual garden snow peas, carrots, and greens. But even with the luscious steak it seemed so … usual. So I chopped in some homegrown Thai basil. I liked the Asian drift and whisked up a peppery vinaigrette with rice vinegar, salad oil, and just a hint of sesame oil, then tossed in a sliced peach for sweetness. 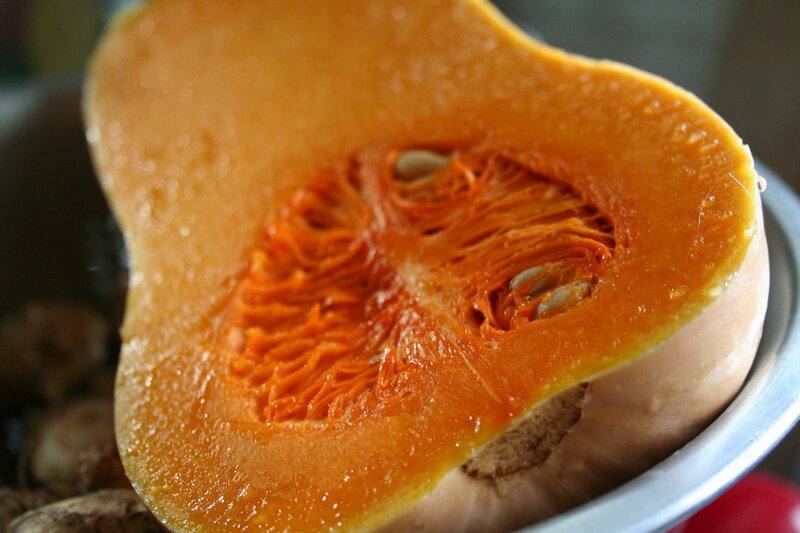 It was the perfect metaphor for summer — light yet nourishing, and gone so quickly. Thanks to summer weather, our fava beans came ready all at once. It was a poor man’s version of needing to spend a million bucks in one day, give or take. And this was one motherlode of a crop I knew very little about. So there was a learning curve. First lesson: plan to spend your sweet time breaking these babies down, because there’s shucking, boiling, and peeling before you can really even contemplate what to cook. With the beans denuded, we attempted the usual preparations. We ate the favas raw with olive oil, salt and pepper. We pureed them with rosemary and garlic. Both ways were delicious, but we still had seven pounds to go. We ate the beans whole with salmon ravioli, and they were good with the fish and chopped fennel. I froze a couple pounds of the remaining beans for a fall stew. It takes creativity to turn cooked food into something nearly new again. My fellow blogger Stephen noted as much in his post-Thanksgiving post about making noodle soup from a turkey carcass, with the bone marrow squeezed out for that much more local goodness. Here in a less wild corner of the Northwest, I’m discovering that ham roast is great for leftovers, and not just as reheated slabs on the plate. You may recall our first ham, pot roasted in Maderia and gnawed down to a bone that my mother-in-law handily turned into split-pea soup. A more recent roast, also from the Methow Valley’s Crown ‘S’ Ranch, produced a good pound and a half of leftover meat. Necessity being the mother of invention, we layered ham slivers into lasagne with tomatoes and mushrooms, scrambled ham bits with eggs and goat cheese for Sunday brunch, stirred diced ham into a risotto with peas and kale. It was all as truly delicious as it sounds. The meat remained firm and smooth even after additional heat was added; perhaps roasting the original joint in a 200 degree oven did something to stabilize the cells. Anyway, as we whittled away at our ham, I pondered the sustainability angle of eating leftovers. Yes, nothing got wasted, but more critically we ate less meat, using the ham primarily to flavor and flatter the companion ingredients. If you believe the numbers on how much fossil fuel goes into creating a pound of meat — see Mark Bittman’s Rethinking the Meat Guzzler for some specifics — yet remain omnivorous, then this is a happy development. For the first time in a long while we didn’t host a Thanksgiving dinner this year. Fewer dishes to do but the leftovers were somewhat scarce and we were without the most useful part of the bird — the carcass. Homemade turkey broth can’t be beat. It’s the key component in this turkey noodle soup recipe from Stephanie’s mom Betsy. The girls love it and plus, we get as much as we can from our $3.85/pound purchase. We cooked a 10-pounder on Sunday and made a big batch of soup on Monday. Turkey broth: Simmer one turkey carcass plus chopped onions, carrots, and celery in about 4 quarts of water for 2 to 3 hours. Strain out solids, reserving the broth, and pick meat off the bones. You can unleash your inner Cro-Magnon and break the bones to simmer out the marrow but be careful not to create bone slivers. Turkey noodle soup: Mix 1-2 cans of cream of mushroom soup into the strained broth. Add turkey meat and simmer. Cook one package of noodles (spaghetti or homemade noodles both work well) and add to the soup. Heat together and serve. We cook a fresh local free-range bird from Triple D Farm and Hatchery so a little salt is usually required.